A free-style concerto for solo horn and orchestra. The piano reduction version is used as a compulsory work for the final round of 21nd. International Horn Competition in Portia, Italy. Composed at the request of Hoshina Academy Chamber Orchestra “Emsemble=Harmonia”. 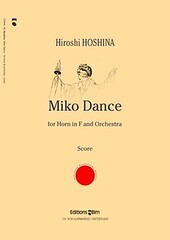 Score sample is available from EditionBim .